We have collected the all kind of Japanese antiques. We are happy to understand you the matter. Worst two months. We will make every attempt possible to resolve the issue if we made a mistake. Also to get proper amount of compensation in case of item breakage. I AM NOT AN EXPERT, BUT THIS IS A FANTASTIC PIECE. Beautiful white Japanese Imari hand-painted vase. Delicate woven lattice design around center band of the vase. Marked on bottom in 4 Japanese characters with "Handpainted" and "Imari.". There is also original "Made in Japan" foil sticker on base. From that point onward, he continued to display his works in the Saga Prefecture Exhibition and, from 1968, the Japan Traditional Kogei Exhibition. Sakaida Kakiemon XIV (1934-2013). Born the eldest son of the 13th generation Kakiemon, he learned pottery from his father as well as his grandfather (the 12th generation Kakiemon.). 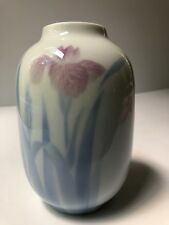 Japanese Fukagawa Vase Porcelain Iris Flower Arita Japan. Item:Japanese antique Imari ware Hyoutan-shaped Vase with Plum blossom Age:Late Edo period Size:24.9cm height,13.5cm width Good Condition with small crack on the rim Please see picture. .
※KUTANI YAKI (KUTANI CERAMIC). The origin of the five spectacular Kutani colors. give Kutani porcelain its characteristic beauty. Kutani porcelain was revived under the patronage of the Kaga clan. Kutani porcelain,which combines the artistry of Ko-Kutani ware and the utilitarian beauty that developed from. Item:vese sighed by national treasure Sakaida kamiemon with Box Size:2cm diameter of mouth 16.2cm height Great condition with slight wear . Vtg Korean Celadon Flower Vase Kabin. Korean celadon flower vase. Elephant face shaped handles. Item weight: 5.95 kg. Doing that is against U.S. and international laws. There are stains. Cave of Treasure. P urchases must be completed. You get it in the original condition. We will be more than glad to help. Kutani ware has a history over 360 years and various painting styles born from it. Manufacturer: Kutani Eizan. Type: Vase. Type: porcelain. Be sure to read the information to avoid problems. 【information】. Asian Oriental Vase White River boat Tree Glazed Porcelain 8" Tall 5" Wide - Marked. Set of two vases plus one ashtray. Super great lion image on each! A large and unusual porcelain vase from Arita, Japan, circa Tenpo years (1830-1844) of Edo Period. The vase was decorated with underglaze blue and white and the glaze displays an even crackles throughout. This vase has a beautiful hand painted with red flower, black leaves, and gold design. This vase is made in the Arita or Imari ware style.Old Imari is quite probably the most famous Japanese ceramic product in the world. Details: This is beautiful Vtg small flower vase from Japan. This small ikebana flower vase is shaped like a small coiled up snake and it made of beautiful white porcelain. Material: Porcelain. add to fAVORITES. Founded in 1887. It is a Imperial Household Agency Warrant. This is made by Arita-yaki of Imperial Household Agency Warrant. 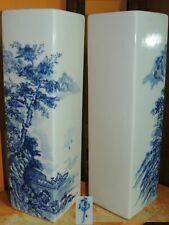 Vtg Japanese Kutani ware Porcelain Flower Vase Kabin. Japanese porcelain flower vase, Kabin. Kutani ware, Kutani yaki. Beautiful chrysanthemum floral design. Item weight: 700 grams. Signature on the bottom. Details: This is a beautiful Satsuma yaki ware flower vase or Kabin from Japan. This vase is white with a beautiful and colorful floral pattern on the side of the vase. Material: Porcelain. add to fAVORITES. Diminutive size at just 3 5/8" tall, stand adds 3/4" and is 2" across. Petite vase features gold lettered poetry along with green, rust and blue swaths. Japanese cloisonne vase. ART DECO piece. Japanese porcelain flower vase, Kabin. Having long neck like crane one, Tsurukubi in Japanese. Floral arabesque design. Item weight: 500 grams. THE VASE HAS AN INTRICATE HAND-PAINTED GEISHA GIRL SCENE WITH GOLD DETAILING & THE PITCHER HAS HAND-PAINTED GOLD BIRDS WITH GOLD TRIM. THERE IS JAPANESE WRITING ON THE BOTTOM OF BOTH. BOTH PIECES ARE PORCELAIN. Location: L 259. Great condition. Marked on base - Hand Painted Japan. I often list fine cloisonne, but I am cleaning house, so who knows what you will find. Very old piece, still displays well from the front. Large hairline on the back. plug in the bottom. 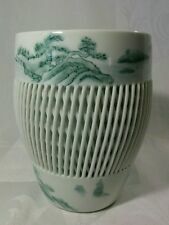 Vtg Japanese Porcelain Celadon Seiji Flower Vase Kabin. This vase features a drawstring bag. Material: Pottery, Ceramic, Yakimono. add to fAVORITES. Vtg Japanese Akogi ware Flower Vase Kabin. Akogi ware Kabin. Pottery, ceramic, yakimono. Beautiful persimmon design on White background. Item weight: 950 grams. (1) Avoid damaging paint or material on the item. 2) Avoid potential adverse reactions to certain chemicals by any little ones playing with the toys. This vase has a beautiful hand painted glazed flowers red and green colors and a cracked glaze. This vase is made in the Arita or Imari ware style. Old Imari is quite probably the most famous Japanese ceramic product in the world. This is a beautiful vase made by KAKUMO China of Japan. It is a quality white china decorated with colorful applied butterflies and pink and purple flowers. The butterflies appear to float effortlessly over the surface of the vase. ONE VASE MARKED "HAND PAINTED JAPAN". Good condition. 41/4" Tall x 4 1/2" wide. Satsuma Porcelain Ginger Jar. Peacock and Cherry Blossom design. Ginger colored trim with gold detailing in the design. Made in Japan. Gold trim throughout and gold on top of lid. Very pretty - embossed and accented with 22kt gold accents. Item #4010. Signature of Potter at the bottom of the vase. You can also opt for. Good Condition. Bottom has dirt due to age and use. [Condition].